Absolutely correct. If i remember correct our association had decided to file a review petition in the supreme Court. I wonder what happened to that decision?. I don’t know what you mean by “camp sites” but it looks you are unaware that the zonal benches are full time permanent benches and have jurisdiction over the states falling under their zones. The benches in Delhi are not the only ones. Delhi is just for the north zone and also some cases are transferred to Delhi when there is a disagreement between the members in regional benches or other such unusual circumstances. Also, the regional benches do circuit benches by sitting in High Courts of other states. Since this is a relatively new tribunal, circuit benches are not very active yet but there have already been a few sittings at least in Himachal High Court. Soon, a second bench will be constituted in Pune and Chennai and circuit benches may become more frequent then. There is only one tribunal, one chairman.. Zonal benches are under the chairman.. The Zonal Benches are fully empowered to accept, hear and decide cases. I am not sure what you mean by “zonal benches are under the Chairman.” The Chairman is the administrative head and he can reconstitute benches etc. but that is true even of High Court benches where the Chief Justice is the administrative head. I don’t see how the location of the Chairperson would affect the functioning of the zonal benches! I agree with you that the number of benches can never match the number of civil courts and high courts. But calling it is a step backwards just on the basis of their number is far fetched! You should also consider the backlog of cases in an average High Court or civil court and the average time they take to dispose of cases. The NGT takes an average time of less than six months per case right now. This is speedy justice and when compared to High Courts and other Civil courts in India, it is super-speedy justice. 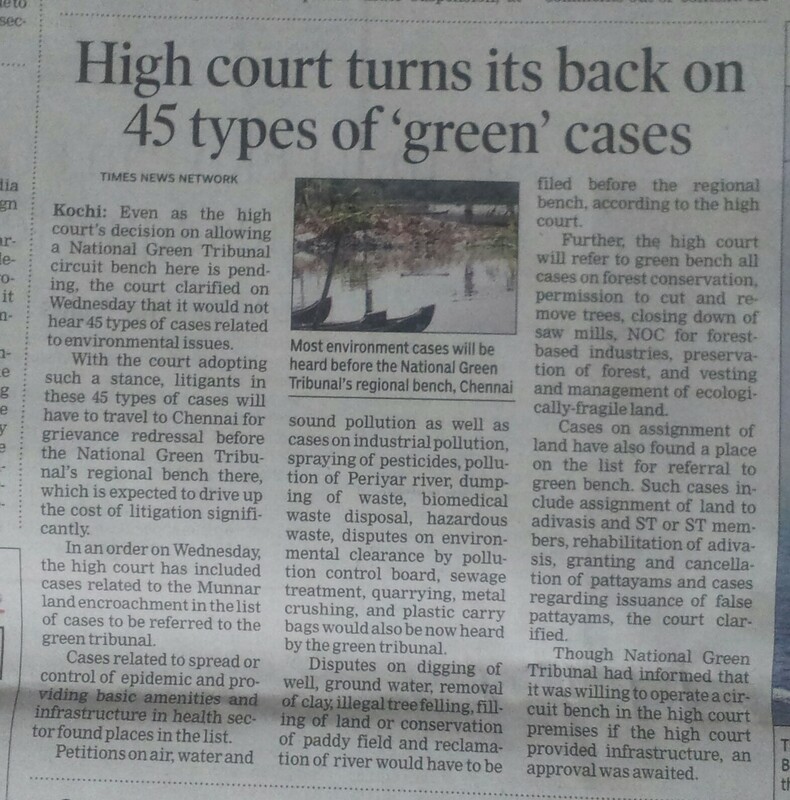 It is definitely a step forwards, rather a leap forwards for environmental justice in India. I wonder if you’re a lawyer. I am an Environment lawyer and I wish to bring to your kind notice that environment matters cannot and should not be adjudicated upon in Civil Courts for the simple reason that the Environment matters are very technical and the NGT has been formed keeping that in mind. I also understand that you don’t know of all the other Tribunals in India which deal with specific technical matters with expert benches. NGT was established in 2010 and it has kept up it’s promise of delivering a judgement within 6 months! We should be proud that we are the third country in the World to have a court like this. The work that the court and lawyers are doing is commendable. Maybe you should go to the Tribunal one day and actually sit through a matter instead of posting a sarcastic blogpost about the Tribunal.